A subjective essay is a paper that contains the author’s own opinion that is yours if you deal with it now, no one else from your surrounding. Even authoritative authors stand on the sidelines, except the case when you want to refer to quotes from their works. A subjective essay does not contain a detailed investigation and is based exceptionally on the opinion of the author, unlike an objective essay. However, this type of essay, as well as other types, consists of 3 basic parts that are the introduction, the main body, and the conclusion. It is a perfect kind of an essay for the expression of philosophical or social ideas. One of these ideas is expressed in this article. Look at it and make proper conclusions on what your essay can include. Additionally, all the peculiarities are provided in details which you should keep in mind while writing a subjective essay on your own. Let’s go! “Everyone has his own opinion on the matter of fashion. Some people believe that fashion is something that is worth adhering to or even obeying. They carefully choose the clothes and music they admire. Moreover, they buy fashion magazines and study the latest fashion trends. Nevertheless, there is another type of people. They believe that fashion does not apply to their own lives. Fashion magazines are boring for them because they do not suit their personal interests and do not develop their personality. Furthermore, they think that fashion specialists don’t affect their lives and they choose clothes on their own. Most often, this type of people thinks that people are chasing fashion and that such a kind of behavior is unreasonable. In my opinion, both sides are correct in part. I believe that it is important to follow the fashion because it makes the person connected with his/her own era and the culture which is crucial for self-representation. Nonetheless, it is right to have your own style rather than blindly believe the journals. There are several arguments in favor of the fact that both views are correct in part. First of all, many people think that fashion does not affect them and they dress the way they want. It is not true because if that were the case, some people would have dressed in corsets and a crinoline. However, modern people prefer jeans and T-shirts instead of heavy dresses and tuxedos. Thereby, it is a fact that each of us relies on the experience of modern fashion each morning. Furthermore, some people think that everyone has to follow the fashion. For some reason, it is an established opinion that “to be fashionable” means to dress up the same way as the models do. Nonetheless, this is not quite right. The fact is that fashion should be for us, not vice versa. Fashion magazines offer the public only what society is willing to accept. Therefore, when a person buys a pink jersey, he/she makes it more fashionable without even realizing it. Read the whole subjective essay? Now, you need to write your own essay where you are supposed to express your personal opinion. It is better to write a subjective essay without relying on someone else’s opinion (you can rely only on our professionals if you want to relieve yourself from the pressure of essay writing – it was time for ads and now go on!) So what are these details that will make your essay stand out? A full understanding of the essay question. Don’t rush into writing a subjective essay immediately after its assignment. Read it so that you can get the grasp the main idea that you need to write about. Avoid the situations when you start writing an essay – have written half of the necessary word/page count and, as a result, you get lost in the meaning of the topic. At least it might seem you were on the right track, but now you lose yourself in verbiage. For that reason, you shouldn’t neglect the prewriting process when you prepare an essay outline with the main points and sub-point you want to use in a future essay. An arsenal of creative and original essay ideas. Today, many essays are available for you. It comes easy for students to find all possible ideas for their essays – God, save the Internet! But will your essay stand out among the other students’ essays if you apply to common essay ideas? The answer is no! Your task is to be original even in your own opinions. It doesn’t mean that you should change your point of view completely. Just add an original way of expressing it on paper. Think of vivid examples from your life. Use various stylistic devices to diversify your writing. 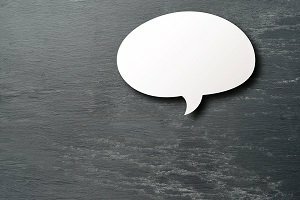 Be open to all opinions in the world, but know how to express your own – a subjective essay is the best way to learn to do it! 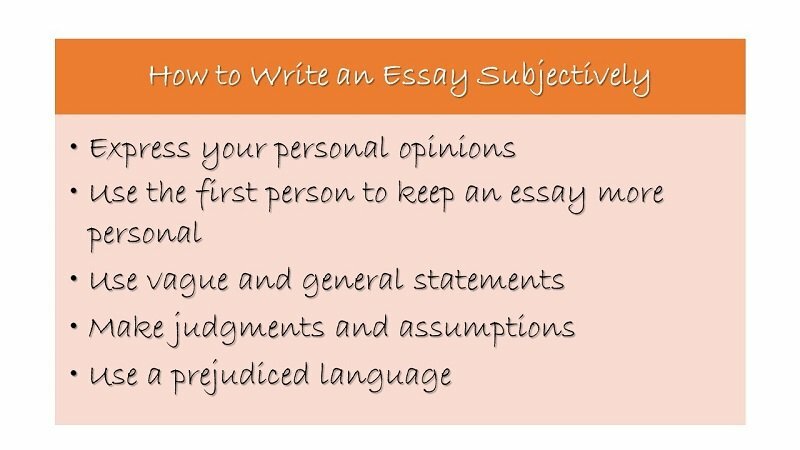 We do all the best to demonstrate how to write a subjective essay (ever a ready essay is presented to you). Now, it is your turn to apply all the essay writing tips in practice. Good luck!